The industries contributing to Maine’s economy have shifted over the past several decades. Once known primarily for ship-building and the production of paper, today Maine’s fastest growing industries are healthcare, retail, tourism, education services, and construction. Fortunately for those preparing to enter the workforce, there are several vocational and trade programs throughout the state offering training and certifications within these high-demand fields. For students interested in developing a professional career with a vocational certification or post-secondary degree, this guide outlines the opportunities available in Maine. Maine provides a solid selection of vocational and trade school opportunities for potential students. Some of the biggest job sectors, including nursing and computer technology, can be studied at Maine's community colleges and vocational schools. 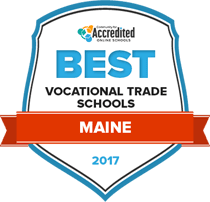 Our rankings list takes into account numerous factors, including tuition rates, financial aid availability, student-teacher ratio and more in order to provide a well-rounded list of accredited trade schools in Maine. Vocational programs at Northern Maine Community College provide demonstrated career preparation for students, with over 90% of graduates finding employment relevant to their studies or continuing their education within six months of graduation. Programs run the gamut from technology-based areas of study such as wind power or computers and networks, to traditional trades including plumbing and heating or structural welding. The school provides library resources with both physical and online collections, and access to e-books, audio books, iPads and laptops, and information-literacy instruction. Students can also pursue work experience or financial assistance through paid and unpaid internships and leadership opportunities. In addition to providing vocational programs in numerous occupational fields of study, Washington County Community College offers many of the student life resources typically found at traditional four-year schools: on campus housing and dining, child care facilities, and academic and IT support. The campus provides modern classrooms and laboratories in addition to an outdoor adventure center. Students interested in continuing their education after completing a vocational program can take advantage of the school’s articulation agreements with four-year schools in the University of Maine System. Career resources are also available for graduates entering the workforce, with access to the statewide Calais CareerCenter for free employment and training services. Students can earn Associate in Arts, Associate in Applied Science and Associate in Science degrees, as well as certificates and other diplomas, in more than 30 program areas. The school's Student Success Center offers academic advising, peer mentoring, disability services, lunch and learn workshops, writing lab, placement testing, tutoring and supplemental instruction for mathematics. The school also has a special track for students interested in the high-demand field of IT. EMCC offers alternative credit for prior learning, credit by examination and credit by assessment. The school maintains programs for high school students, as well as a Phi Theta Kappa honors society chapter. Vocational programs at Maine’s Kennebec Valley Community College run the gamut from culinary arts to allied health, with numerous tracks focused on trades and technology. Programs impart the skills needed for employment after graduation, combining skill sets and curriculum into programs that are unique to KVCC. Students with work experience who desire a college degree to open new job opportunities can pursue the school’s Career Studies program. This degree track allows students to earn up to 24 credits for work and life experience, based on a portfolio that aligns these experiences with college courses. Curriculum at Southern Maine Community College centers on hands-on learning, with instructors who work in the field and can bring real-world experience to the classroom. Vocational programs are offered at the school’s two campuses, with some courses available at satellite locations throughout the state. Prospective students who are enrolled in or have completed an apprenticeship program can pursue the school’s Trade and Technical Occupations degree, which combines the skills that students learned in their apprenticeship with additional coursework, leading to an associate in applied science degree. Other areas of study combine general education courses, subject-specific learning, and lab work to award AAS, AS, and AA degrees. Students at York County Community College benefit from small classes and a course schedule that is designed to accommodate learners with work and family obligations. The school’s vocational programs can be completed in one or two years of coursework. Students can accelerate their programs by applying for prior learning credits. These may be awarded for work and volunteer experience, professional certifications and military training. YCCC also offers a learning center that provides free tutoring in core subjects and support for students adjusting to the academic requirements of higher education. Free workshops guide students in the skills needed to successfully complete a vocational program: setting goals, managing time and staying organized. Central Maine Community College’s vocational programs are held on its lakeside campus, with on-campus housing available for matriculated students. Students may also take courses in off-campus sites closer to home, in Franklin, Lincoln, or Oxford County. These sites provide technical, medical, and other instruction with the added benefit of small class sizes. The school offers tutoring services, an academic advisor, and a First Year seminar that helps students adjust to college life and higher education studies. Students still in high school or attending a career technical education center can earn credits for coursework and experience, allowing them to accelerate their degree program and begin their career sooner. The Landing School is a marine industry technology college that offers multiple programs boat and yacht design. These vocational programs will be completed in highly specialized classes, allowing students to integrate themselves into the field’s community while focusing on the classes they’re interested in. Approved veterans will receive tuition benefits, and financial aid options are available to all students. Numerous scholarships are also available and awarded to students who exhibit excellence in their academic pursuits. The Landing School is accredited by the Accrediting Commission of Career Schools and Colleges. Vocational and technical certificates allow students to gain the necessary skills to join the workforce in several growing fields in the state of Maine, with less time commitment than pursuing four-year degree options. Use the search tool below to find a school and program near you. According to the U.S. Department of Education, there are 27 Career and Technical Education centers and regions in Maine. Maine’s career and technical schools offer unique program options like alternative energy, biotechnology, and outdoor power technology. As of fall 2015, 17,464 students were enrolled in community colleges throughout the state of Maine. The majority of community college graduates—92 percent—find employment in Maine. While the majority of students enrolled in higher education institutions in Maine earn a bachelor’s degree, the Maine’s student population is comparable to the national averages in terms of one-year certifications and associate’s degrees. The programs offered in the state, including those at the subbaccalaureate level, support the growing industries in Maine. Due to the shift in dominant industries within Maine, from those centered on manufacturing to those in service-related fields, the demand for individuals with training in healthcare and education continues to grow. According to Maine’s Department of Labor, jobs in the service-providing domain account for 83 percent of the state’s current employment, with a heavy emphasis on various health-related occupations including hospitals, ambulatory (outpatient) health services, and nursing care facilities. Maine has also seen a significant drop in unemployment rates since 2009, with their current unemployment rate at 4.1 percent, which is lower than the national average of 5 percent. This information bodes well for job seekers in Maine looking to start their careers in a new field. For students considering a postsecondary certificate or secondary degree, the chart below shows Maine’s largest career opportunities in terms of job openings, anticipated growth, as well as how the median wages compare to the national averages. Located on the coast, Portland is the largest city in Maine with a population of just over 66,000 people. As a port, the city’s economy was historically supported by fishing, manufacturing, and agriculture, but there has been a shift in recent years to a more service-based economy. As a job seeker, Portland is appealing due to the fact that it has a low unemployment rate (2.9 percent) and higher median incomes than most other communities in the state. The Portland-Montreal Pipe Line is a contributing factor in the area’s strong economy. Portland is home to Maine Medical Center, the largest hospital in the state, as well as Mercy Hospital which is the fourth largest hospital in Maine, making this location ideal for registered nurses, licensed practical nurses, medical assistants, and other healthcare careers. Portland is home to Southern Maine Community College, which offers vocational and trade certificates, as well as associate degrees, in fields related to engineering technology, construction trades, building and plumbing technology, and health-related professions. These programs support many of the prevalent industries in Portland and the surrounding communities. For students interested in the quickly growing need for hairstylists and cosmetologists, Empire Beauty School -Maine offers certificates for specific occupations in cosmetology, including barber and nail technician training. Meanwhile, the Portland Arts and Technology High School offers training and certification in a variety of programs such as manufacturing technology, early childhood occupations, and automotive technology. Students graduate with skills necessary to fulfill the job requirements of many of the state’s common industries, or move on to earn associate degrees or career certificates. Comprehensive resource for construction professionals by providing support through legislative policy, regulatory reform, business networking, and workforce development. Provides a platform to share information among building inspectors in the state of Maine, through monthly meetings and quarterly conferences. Comprehensive resource for Maine job seekers. Includes job search tools, unemployment assistance, training information and resume help. A resource for prospective and current students providing information about Maine’s network of 27 career and technical schools. Oversees state-wide programs related to workforce development, pathways to college and career, quality improvement, and institutional research. General information about CTE and a collection of resources including state standards, frequently asked questions, and information for prospective students.